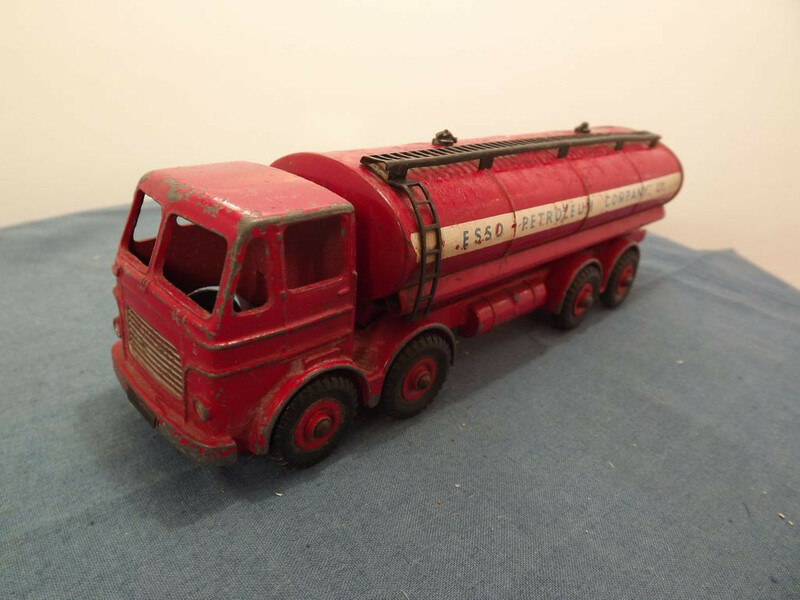 This model is the Dinky 943-G-1 Leyland Octopus Tanker in Red "Esso" livery. The model features a red cast metal cab and chassis with a tin tank in red with white stripe along the tank. The grille and headlights are painted silver. On the tin tank are a black ladder and catwalk, two black tanker caps and blue lettering reading "Esso Petroleum Company Ltd" on the white stripe on both sides. 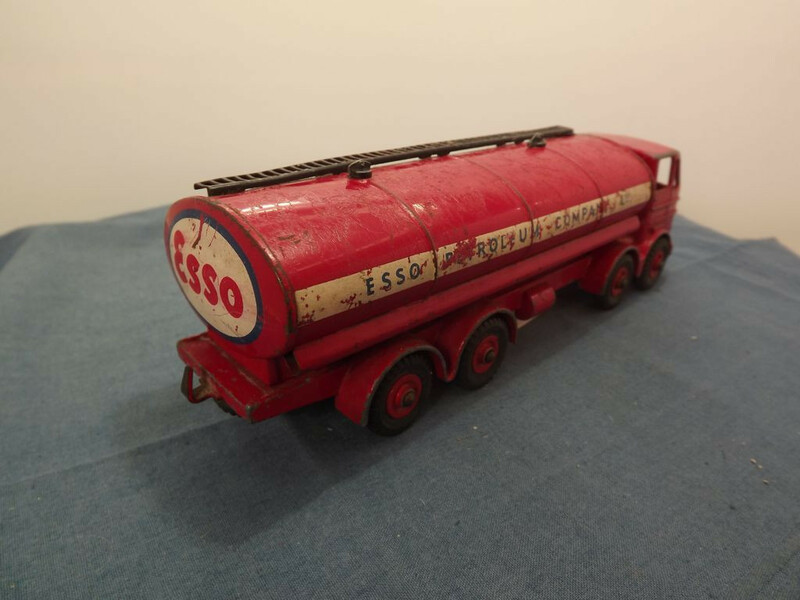 At the rear of the tank is the Esso emblem in red, white and blue. There is no interior, or glazing, on this model. All wheels are black rubber with red metal "Supertoy" hubs. Dr. Edward Force's book, "Dinky Toys", indicates the hubs are plastic, but I believe the model was issued with both metal and plastic hubs during its production. "The Great Book of Dinky Toys" by Mike and Sue Richardson only mentions that the hubs are red. 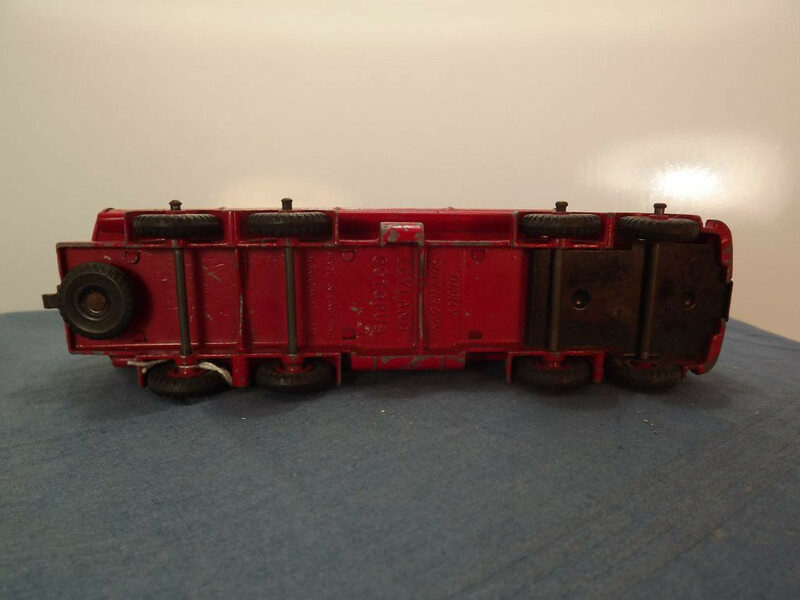 The baseplate is actually the chassis casting and it is red painted metal with Dinky Supertoys in the centre, followed by "Leyland Octopus", then "Made in England" and lastly "Meccano Ltd". A Black painted Tin sheet base/cover sits below the cab, held in place by a front body locating tab and the front rear axles. This model was issued between 1957 and 1964.